After a month long hiatus, we started with another few walks to finish the LOOP within our one year goal. I made an extra few checks to make sure I was recording a trace with my GPS (successfully). 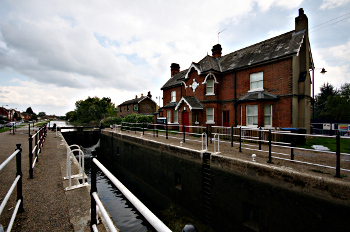 Starting at Enfield Lock station, our first highlight was, as you might guess, Enfield Lock itself. After the lock, we continued first past the river Lee, and then the King George V reservoir, and finally the Rammey March Flood Relief Channel. In a field we found some very tiny horses as well. 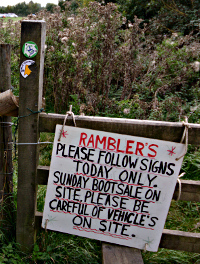 Crossing a road, our route was disrupted by a car boot sale. Instead of traversing a field diagonally, we had to zig zag around it avoiding cars and vans. At the end of the field we started climbing up Daws Hill which gave some nice views over the King George IV reservoir. At the top of the hill, we got minimally lost, as our path continued through a hole in a hedge that was quite overgrown. Once we found the path through, we ended up in a meadow. 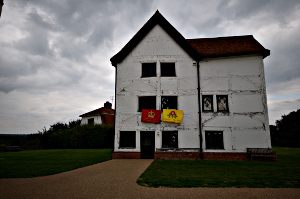 After a while we got to the Gilwell Scout Centre, which was rather empty looking. Some fields later, we made our way to Chingford. Instead of following the LOOP through a car park and past a road, we continued along a field directly to The Royal Forest for a refreshing pint. After the beverage, we continued, now on section 19 of the LOOP. Near the pub we passed the Queen Elizabeth's Hunting Lodge and a café. We then had to push through some undergrowth to continue our way towards Buckhurst Hill. Not long thereafter we had a quick snack at Simply Seafood on Epping New Road. A rather "local" establishment, serving a multitude of various seafood dishes. We stayed on the safe side and had a fish finger sandwich. After filling up, we walked to Buckhurst Hill, where we crossed the Central Line section to Epping. The walk through Buckhurst Hill was nicer than I thought it would be. Instead of walking through a town, the LOOP guided us in between residential areas through a patch of green ending at a pond (or reservoir). After going around a David Lloyd sports centre the last part of the walk crossed the M11 and got us past a road into Chigwell, were we celebrated yet another successful walk at The King William IV for a few snacks and another pint. On the way to Chigwell station, I did a spot of mapping to get some more shops, and a postbox, onto OpenStreetMap. The weather was rather cloudy and it wasn't very warm, at about 20°C. We took 3¼ hours for the 15km that both sections took.